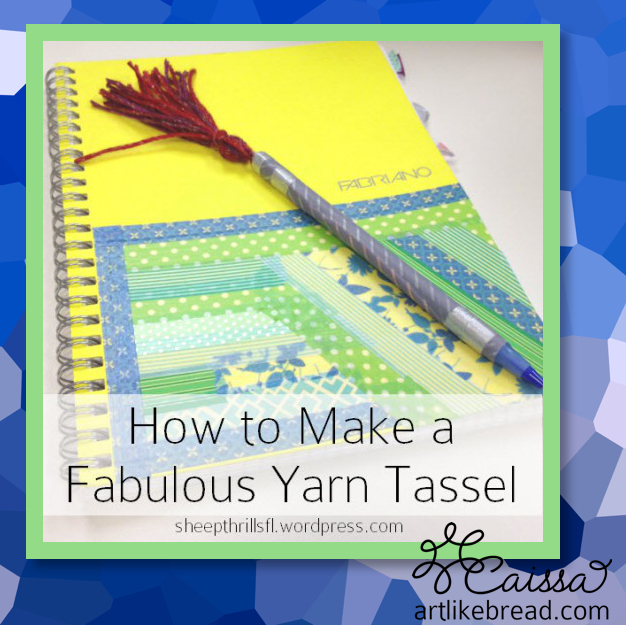 One of my proudest accomplishments of 2015 was expanding my skill set through blogging for different yarn crafts. Deeply exploring yarn crafts other than crochet prompted me to think about yarn in different ways and at different levels. I paid much more attention to knitting than I normally did before that, and I also tried my hand at weaving. Working from there, I thought about other ways we can craft with yarn. Some people just love yarn but don't want to use it in the typical crochet and knit ways. All of those thoughts led me to become very interested in tassels, and I came up with the following tutorial. Please click the picture to link directly to the step by step tutorial on how to make a tassel! Mouse over image or click the button below to save this link to your Pinterest! If you would be interested in learning how to make a tassel like this in person, please let me know by leaving a comment or contacting me at artlikebread (at) gmail (dot) com. As always, thanks for reading the blog! Please leave your thoughts, ideas and questions in the comment section below. If you liked this post, please share this post with a friend through social media & dress up your pens & bookmarks with handmade tassels! Like my Facebook page for updates and more crafty sharing!